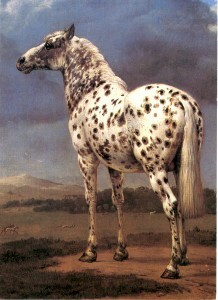 The spots on this impressive horse are not black, but brown with a lighter ring. It is striking that Paulus Potter at the end of his life painted some impressive horses, such as this one, in contrast to the common horses in his farming and rural scenes from his earlier life. Potter must have been fascinated by the spotted pattern and the spots themselves, because he rendered them very precisely. With its heavy neck and short body this horse could have come from Spain, but the spotted pattern was not common there, so its origin remains unclear. The hilly landscape does not seem Dutch. On the left we see a hunting party and a country house. See also Walsh, Buijsen, Broos, Paulus Potter, paintings, drawings and etchings. The Hague 1995.